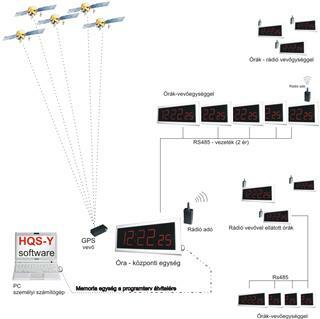 HQS-Y digital clock systems to provide accurate time display in schools, facilities, logistics centers, factories, etc.. If necessary, control can be fitted with, for example. bells, beacons, or other equipment to operate. The clock systems a HQS-Y01 core hours and more (unlimited) or HQS HQS-Y02-Y03 hours. The precise time synchronization radio signal (wireless wirelles) or RS485 (cable) or a combination of signal transduction. The central unit of the time, the GPS buyer receives the ring plan or other control devices via a computer, and then permanently stored in its EEPROM memory, until it should not replace. The display quality of each hour in order to measure the surrounding light intensity and on the basis of regulating the brightness of the display. The central unit, which is externally no different to the other hours (display with), the buyer receives the precise GPS time. Performs synchronization every minute. The central unit is synchronized with the other clock (display) once per second for a wired or wireless connection.The system will automatically switch to the winter-summer time. Digital clock system not only provide accurate time display, but the date and internal-external temperature display as well. In addition to the above functions, display management system can also be used. Optional relay outputs can be incorporated into all hours (display), bells, lights, air conditioning, heating, ventilation, etc.. operation. The turning-off plan may be permanent or repeated. Potential of the equipment (system) programming by the user through a computer. In this case, the device should be extended to a central computer connected to input or memory interface. The control program is given the task associated with.